MIAMI-DADE – The Miami-Dade Board of County Commissioners on Sept. 5 unanimously supported a resolution directing the County to continue to use the resources of the U.S. Department of Energy’s SolSmart program and to further improve the solar installation permitting process for residences and businesses. 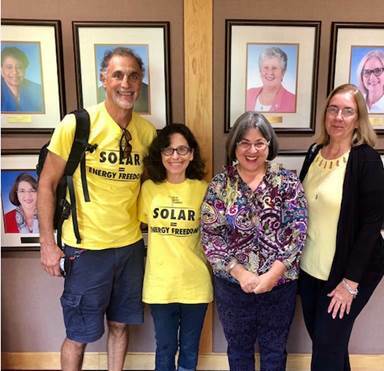 The resolution, sponsored by County Commissioner Daniella Levine Cava, also directs the County to strive to become a national leader in the use of solar energy by actively seeking designation as a SolSmart Gold County. SolSmart recognizes cities, counties and small towns for making it faster, easier and more affordable to go solar. Its national team of experts provides no-cost technical assistance to help local governments become “open for solar businesses.” In recognition of their achievements, communities receive designations of SolSmart Gold, Silver, and Bronze. Miami-Dade County previously received a Bronze rating. For more information on the SolSmart program, visit www.solsmart.org.